How do I renew a resource? 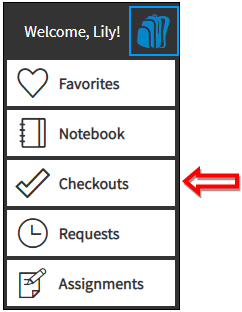 To renew a resource you have checked out, log into your Backpack, click on the Backpack icon, and select Checkouts. Click the Renew button. Please Note: The Renew button will only be available when 5 days or less remain in the checkout period. Additionally, you will not be able to renew the resource if someone else has requested it. How many times can I renew a resource? The maximum number of renewals allowed for each resource is set by your librarian. This number will be displayed on the Renew button. If you have used all of your renewals, you may check out the resource again if it is available.